OK, call me a sucker but show me a clean, bold, simple design and, voila, I'm in love. 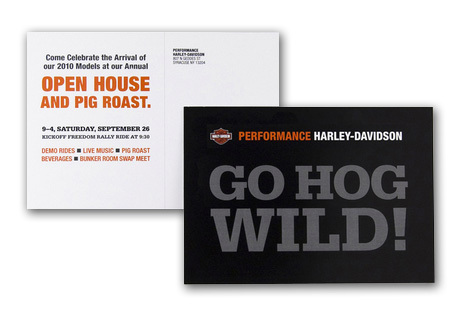 Have a look at designer Michelle Bersani's work for Performance Harley-Davidson open house postcards. It grabs your attention. It's easy to understand. It includes the look and feel of the classic Harley branding. And in a world where you have less than ten seconds to make your point, it does that with time to spare.